LAPD: National Night Out August 7th - Yo! Venice! 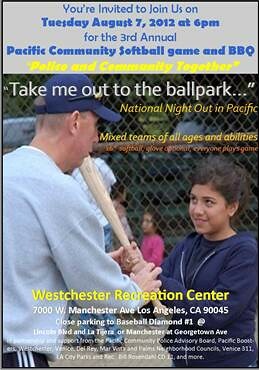 The LAPD will host their 3rd annual “National Night Out” in the Pacific Division on Tuesday, August 7th. “Take me out to the ballpark” is the theme, the event starts at 6pm. Activities will include a community softball game and BBQ to bring “Police and Community Together” Teams are mixed of all ages and abilities, play uses a 16” softball, a glove is optional and everyone interested gets to play. 7000 W. Manchester Ave Los Angeles, CA 90045.